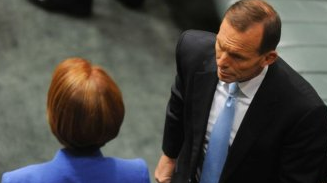 Lets celebrate the muddled coverage of the Gillard-Abbott showdown. Most agree that when Tony Abbott and Julia Gillard went toe-to-toe in Federal Parliament last week they were arguing at cross purposes. The Opposition Leader thought Peter Slipper was an inappropriate person to remain as Speaker. On the other side of the dispatch box, the Prime Minister (not wanting to engage in that debate) took aim at what she saw as Mr Abbot’s “misogyny” and “hypocrisy”. Much has already been written about how the media coverage of this tussle was, itself, disjointed. The mainstream media largely focused on the Speaker’s woes and the day’s effect on Labor’s parliamentary numbers, sometimes deriding Ms Gillard’s performance as a sideshow. Bloggers, the Twitterazzi and the foreign media saw the Prime Minister’s takedown as the real story. So who is right? Both camps. Much like the original dispute, this debate is also running at cross purposes. We can all agree Julia Gillard’s performance — taken in isolation — was masterful. She went in to bat for Australian women in a way that no Prime Minister had (or could) previously. The clip will likely be shown in politics classes, feature in documentaries and remain popular on YouTube (or it’s successor) for years to come. It will be rightly regarded as one of the great performances of Australian politics. But the job of the Canberra Press Gallery was also to offer context. That context must involve mention of Peter Slipper. It also must also involve a genuine analysis of Labor’s parliamentary tactics. And it must involve a discussion about whether the Prime Minister’s feisty performance was a calculated diversion, or simply had that effect. In my view, it is wrong to attack the mainstream media for “missing” the significance of Julia Gillard’s performance. Just as it would be wrong to criticise online publishers for failing to adequately cover the Slipper components of the day. Our new media landscape is meant to be a marketplace, where we select the products we wish to consume. In this instance, we were presented with very different coverage of the same event from various quarters. We were given diversity. A choice. Surely this should be celebrated — not bemoaned? Previous Post Do me a favour? Ignore Alan Jones.